In this life, cupcakes are cooling, waiting for the homemade butter-cream frosting to be packaged in the love bags with some homemade peppermint patties for my co-workers. The cupcakes were not made from scratch, but I know they’ll enjoy them anyway. I used the good ole Duncan Hines mix. I’ll make the frosting from scratch, that should make up for it! 😀 The peppermint patties are currently cooling in the fridge waiting for me to melt the chocolate, dip, then they’ll be finito! You made the patties! Sweet! I want to make them again. 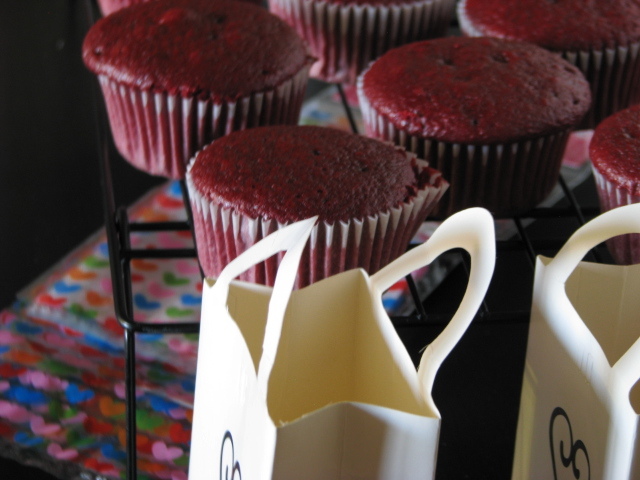 Your red velvet cupcakes are making my mouth water. I’ve also done the cake mix + homemade frosting combo. Such a time saver and turns out yummy too! They (both the patties and the cake mix + homemade frosting combo) turned out wonderfully!!! Your pattie recipe is fool-proof!